Contrary to what the name may suggest, there is nothing drab about the Boring Company. Elon Musk’s tunnel-digging enterprise plans to quickly and affordably build underground passageways connecting the cities along the US east coast. Once finished, the tunnels can be used for the Hyperloop, a high-speed travel-system promising to whisk passengers from A to B at 600mph. However, Musk is hardly alone in dreaming of transforming modern transportation. Not only are huge tech behemoths like Apple and Google developing self-driving cars but startups across the world are also revving up to revolutionise the way people travel. From apps making it easier to plan journeys to firms using big data to open up traffic bottlenecks, these ventures are now promising to change the very nature of the cities they operate in. Given how some unicorns have already changed people’s lives, it’s hardly a secret why startups are gearing up to challenge traditional transport services. “Before Uber and those apps, we had to walk to a road to flag a taxi down,” says Tony Lynch, CEO and founder of Faxi, the smart-carpooling startup. “No one would ever dream of doing that today.” In other words, much in the same way Airbnb did in hospitality, transportation tech startups like Lyft, Blablacar and Uber have shown how innovation can transform industries in dire need of disruption. “Brilliant tech is benefiting everyone,” says Lynch. But no matter how shiny these high-tech solutions are, the engine behind successful enterprises will always be the demand for their services. Luckily for entrepreneurs, there are plenty of things in transportation that need a tune-up. “The car and transit infrastructure is not only old but also very expensive to change,” says Nir Erez, founder and CEO of Moovit, the transportation-technology startup. For instance, UK traffic-easing innovations have been stifled for decades by a combination of long-term government contracts, bureaucracy and old infrastructure, making solving these legacy issues extremely time-consuming. For instance, the Elizabeth Line in the London Underground was first approved in 2007 but is only due to open in December 2018. Similar problems can be seen across every area of public transport. “When a new hospital opens it can take three years before the city acts and makes the relevant changes to bus lines in that area,” says Erez. Fortunately, big data has enabled startups to accelerate these changes. “Mobile devices allow us to collect data in a way that is totally anonymous but that gives us a clear view of the daily demand,” says Erez. “You can compare rainy days versus clear days, summer versus winter and weekends versus weekdays.” He argues that, contrary to cities that only do traffic surveys every third year or so, tech startups can track demand by the second and quickly respond to it. In 2017, that was exactly what Citymapper, the London-based public-transit app, did when it launched a bus service between Highbury and Aldgate after the company’s data revealed a significant need for this service. “Having such huge samples allows startups to understand the need much better,” says Erez. Luckily, governments across the globe are increasingly recognising the need for these startups. “More government grants are becoming available,” says Johnston. For instance, The European parliament has devoted some of its regional funding to support innovations in this field and in December it even kicked off a competition for startups that can develop sustainable mobility solutions. “And in the UK, the government has launched its industrial strategy and provides grants for businesses that are looking at urban development and transport innovation,” says Johnston. And it’s easy to see why the government is stepping up to help: it is recognising how transport technology can help solve congestion problems. “There are several experiments going around the world,” says Erez. For instance, using big data can help divert traffic on motorways, shifting the directions of different lanes to suit the needs. “By having a clear view of people’s demands and intent you can know in near real time how to best serve your citizens’ needs,” says Erez. Moreover, transportation technology in general and driverless cars in particular could potentially change the entire concept of ownership. “There is no doubt that we’re going to stop possessing cars and start buying rides instead,” says Erez. “And when that happens there won’t be a lot of difference between hitching a ride on the Tube and doing the same with an autonomous vehicle.” He believes organisations like TfL will control these fleets in a similar way to how airport traffic control oversees the use of runways. “The autonomous vehicle that picks you up at Piccadilly Circus might be operated by Uber but the central operating system of London will direct the car via a specific route in order to lower congestion,” says Erez. 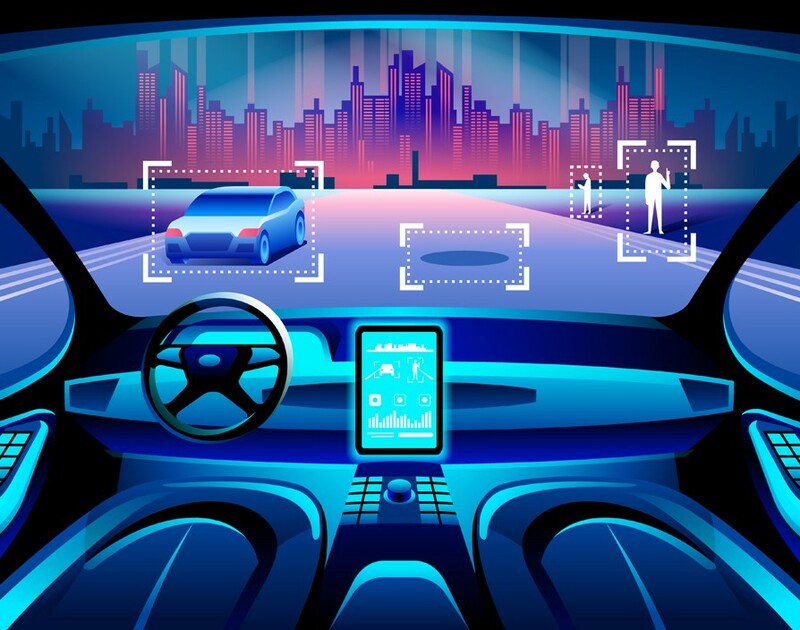 A similar notion was presented in 2016 by John Zimmer, president and co-founder of Lyft, who said that the end of private car ownership could happen as early as 2025. If true, this could dramatically change cities too. “We have hundreds of potential clients who are all thinking about building multi-storey car parks,” says Lynch. But with the rise of autonomous vehicles, there may not be a need for cities to build more garages. Today, cars spend only 4% of their lives being actually driven and the rest being parked somewhere, according to research by the RAC Foundation, a UK transport policy and research organisation. Undoubtedly, if all these cars never stopped moving, there would be no need to build parking spaces. “Multi-storey car parks will not be used in 25 years time,” says Lynch. But whether you’re talking about carpooling with a fleet of self-driving cars or quickly responding to the need of public transport by adding new bus routes, one thing is certain: the world of transport is never going to be the same. “The revolution has only just begun,” concludes Erez.